Gas fired heaters or furnaces provide warm, consistent heat for your home or business by creating and circulating warm air through the duct work of your house and transferred to your house or business. The heat to create the warm air is created by burning natural gas. The hot gases and heat that is created during the combustion process is transferred through a heat exchanger which is basically just a series of curved metal tubes which passes through the air path of the unit. As the heat passes through the pipes is transferred through the metal and into the air passing over it heating it in the process. The left over gasses are then passed out of the system through a metal or plastic vent pipe and into the outside atmosphere. Carbon Monoxide is a colorless odorless and tasteless gas or liquid which is a byproduct of burning kerosene, gas, oil, charcoal, wood, tobacco, gasoline and other petroleum products and comes from incomplete oxidation of the carbon during the combustion process. In appliances that burn fossil fuels like natural gas are properly used and maintained the tiny amounts of CO produced are not dangerous but when they are used or maintained improperly dangerous levels of CO can produce dire results. Hundreds of people each year are killed by accidental CO poisoning. Most of the time the symptoms in these cases were evident before hand but not properly recognized as Carbon Monoxide poisoning. AFUE calculates the percentage of heat delivered to your house and compares it to the amount of fuel that you supply to the heater. For example a heater that has a 80% AFUE rating converts 80% of the fuel that you supply to heat and the other 20% is not converted to heat and effectively lost out the flue or chimney. AFUE is limited in that it only refers to the unit's fuel usage and not its electrical consumption. The government's minimum AFUE rating for heaters is 78%. Many furnaces and heaters manufactured before this rating went into effect in 1992 had AFUE ratings as low as 60%. Heaters with AFUE ratings of 78% to 80% are the most common. If you have a heater with an AFUE of about 60%, you could save significantly on your heating bills by replacing it with a higher efficiency heater. Many times the cost is paid back through savings on lower utility bills. If you live in a cold area where fuel is very expensive consider a high efficiency heater with a rating of 90% or higher. 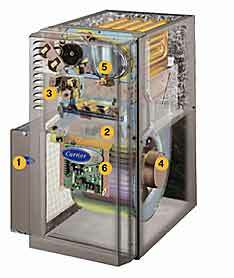 Consult a reputable air conditioning and heating contractor to help you decide which system is right for your area.